Hello fellow A Vintage Journey enthusiasts! Julia here today and it is with great fear and trepidation excitement that I am posting the very first monthly AVJ card post! We thought this year it might be nice to share vintagey/mixed media card designs. I'm the clean and simple girl in the group and so while I buy lots of vintagy, steampunk, mixed media stuff - I don't use a lot of it on any one project! So - without further ado - here is my card. Light enough and thin enough for mailing! 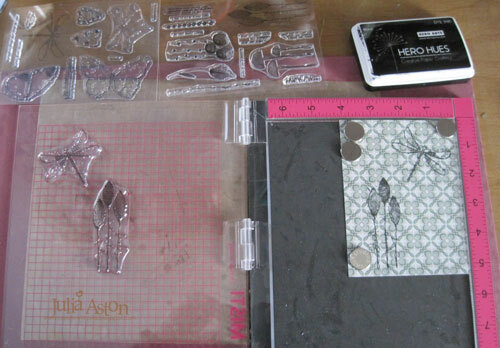 I've used some new stamps and products on my card and I have a few photos of my creative process to share with you. First, I inked up some stamps from two new stamp sets designed by our friend Tracy Evans!! (Whoo hoo, Tracy!!) 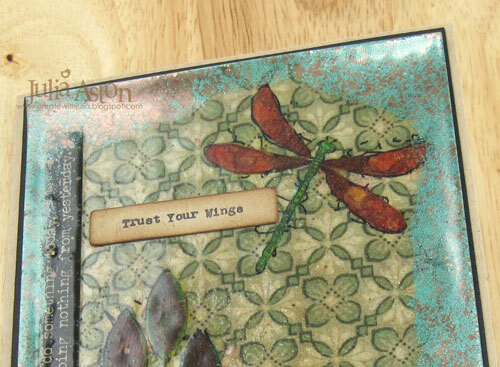 The flower stamp is from Set #44 and the dragonfly is from Set #45 from AALL and Create. I inked them with Hero Arts Black and stamped them twice using my Misti on a piece of Worn Wallpaper, new papers from Tim Holtz/Idea-ology. The paper is thick like wallpaper - and so I stamped it twice to get good coverage. 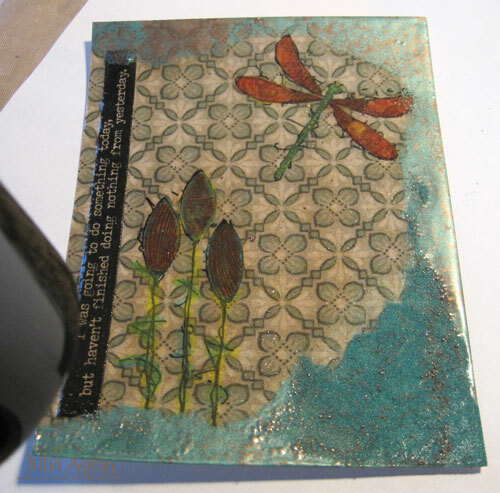 I colored the stampings with various colors of Translucent Paper Artsy paints mixed with a little water, sometimes going over the color with another color until I liked how it looked! I wanted to pull the images out of the busy background paper. Then I got out my brandy-new Baked Texture Vintage Beeswax from Seth Apter-Emerald Creek. I inked my panel with Versamark and added 3 layers of the Beeswax, letting it cool and reinking with Versamark between layers. It brightens everything up and adds lots of shine! To knock down some of the glare (!) 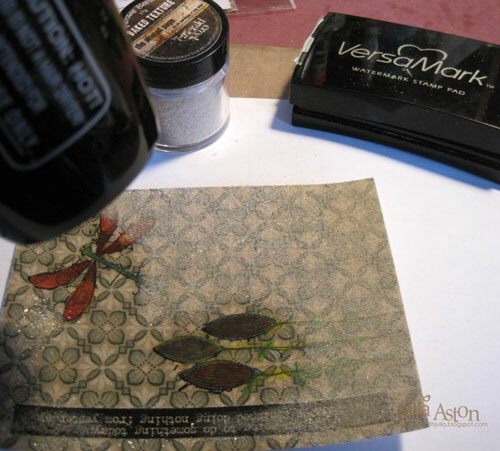 I inked the edges of my panel and embossed with Baked Texture Patina Oxide also from Seth Apter/Emerald Creek. Note: I bought a new heat tool (Ranger Heat It Craft Tool) to use with these new powders - as the one I had blows really strongly and I found it blew all of the Baked Texture powders away before they could melt. (Yikes, what a mess!!) The Ranger tool works perfectly! Here you can see it melted on the bottom left but not yet melted on the right. I LOVE the way the little bits of gold melt in the patina! I stamped a sentiment from each stamp set on a die cut strip of kraft card (Flag It dies from Taylored Expressions) and sponged the edges with Ranger Distress Vintage Photo. I adhered them to the card with ScorTape to be sure they stuck to the Beeswax. Here's what the Small Talk/Snarky Idea-ology sticker says that I put on sideways on the edge before I embossed with the Beeswax. "I was going to do something today, but haven't finished doing nothing from yesterday." I'm not a snarky kind of person usually - but some of them tickle my funny bone! It really has nothing to do with the other sentiments but I had put it on before deciding to add the stamped sentiments, so there it was. Sometimes doing nothing is when we appreciate the little things, like silence and nature, so I guess in that respect they do all go together! I hope I have inspired you today with my card! One of the Creative Guides will be posting a card on the 4th Friday of every month, so be sure to check back for our Creative Card Posts! When there's a 5th Friday in the month - we'll be posting tags as we did last year - the first one will be next Friday 3/30 - since it's the 5th Friday in March! current March challenge - Treasure. We are also celebrating AVJ's 4th Birthday! Thanks so much for stopping by at A Vintage Journey today! I look forward to hearing what you think about my card! 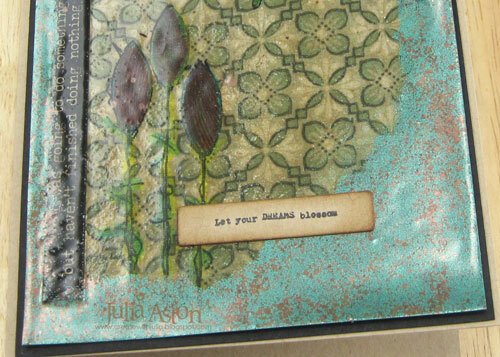 Gorgeous mixed media card, Julia. Thank you so much for sharing all your photo steps and tips. 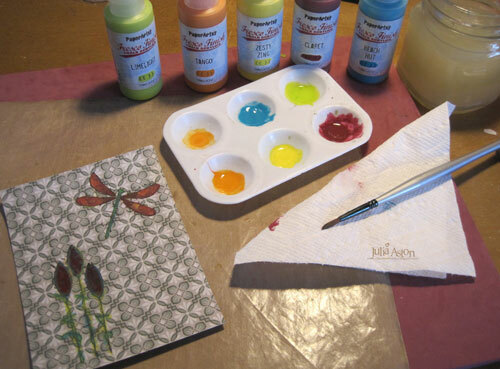 I always am inspired to use more mixed media products after seeing all your beautiful layers. TFS my friend. Hugs. Stunning card,love how you used the coloured embossing powder. Really great looking card. Julia, your card is just gorgeous! I just love all of the product you used on it, you truly married all of the elements so well! 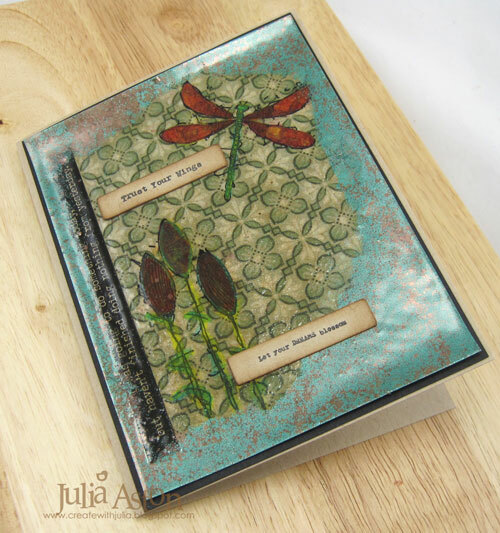 An absolutely stunning card Julia, the effect of the two embossing powders working together is just brilliant and makes for the most wonderful frame around the stamping! Just love the overal look and such a great description of how it all came together!! I just love the finished card, - you certainly have set the bar high for the rest of us! WOW! Congratulations, Julia! You are a perfect choice to start the ball rolling! Your card is wonderful! So much shine and interest! 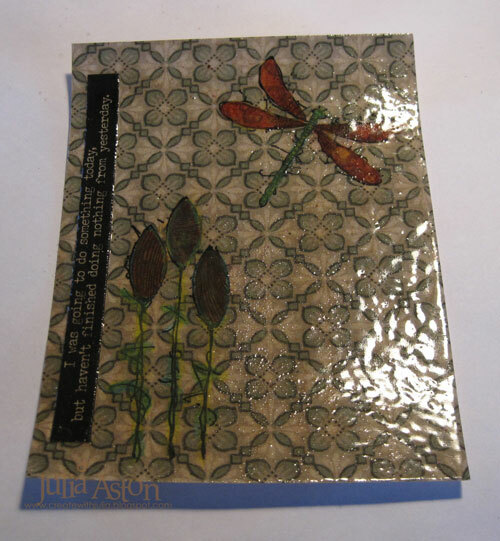 Love the dragonfly and wildflower that are simple enough to let the elements show yet add a wonderful main interest! Gotta love that snarky sentiment! I need to check them out! I LOVE your card, Julia! I love a flat card for mailing, but your's has so much character to it; best of both worlds! Your tutorial is fabulous, and inspires me to put the wall paper on my wish list! Hugs!